Spain is a surprise to those who have the image of having to fight for towel space at one of its crowded beaches or sipping sangria while watching a bull fight or flamenco. From the ancient monuments left by the Romans and Moors, the medieval castles of the interior, the white villages in inland Andalucía or the vibrant cities of Barcelona and Madrid, there is a great mixture of cultural attractions in Spain. The landscape varies just as widely. The evergreen estuaries of Galicia could hardly be more different from the deserts of Almería or the rugged mountains of the Sierra Nevada. And then there are the countless glittering beaches that dot the Spanish coast. Although busy in summer even along the coast of the big tourist Costas some enjoyable beaches can easily be found. One of the top tourist attractions in Spain is Running of the Bulls in San Fermin, Pamplona. 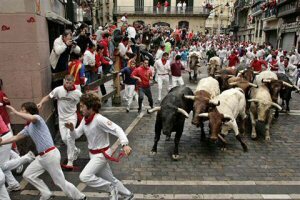 Pamplona is a city in Navarra, famous for its San Fermín festival held each year from July 6th – 14th. At the heart of the festival is El Encierro, the Running of the Bulls, an activity that involves running in front of a dozen bulls that have been let loose, on a course of the town’s streets.